Drop off points, collection points for fund raising packs and more. Below you will find information relating to our current ” 1 in a million ” appeal. Please do keep checking back as more drop off points etc… will be added as we set them up. 9 Anhua Street, Shunyi District. 9-1 Side Park, Jiang Tai Xi Lu Chaoyang District, Beijing. Please put these in a sealed envelope with your name and contact details on it so we can verify receipt. Drop off at one of the points listed above. Donations can also be made directly to our bank account. The account is currently empty and the bank card is kindly being held by LEHMANBROWN, Accountants Firm, who will ensure that all money paid out goes directly to one of the children’s hospital accounts. No member of Roundabout will be able to directly access the money in the account. These will be available via many international schools throughout the city. Please do email us to get your school involved too. Give a gift that will make a difference. This Christmas please consider giving a gift that will help to give essential medical care to one of the children featured on our appeal. Vouchers are available to the value of 50rmb or more – there is no upper limit. 100% of all money received will be used to pay hospital bills for one of the children. You will receive a gift card along with a voucher which informs the recipient that a donation has been made in their name and which child will benefit from the gift. 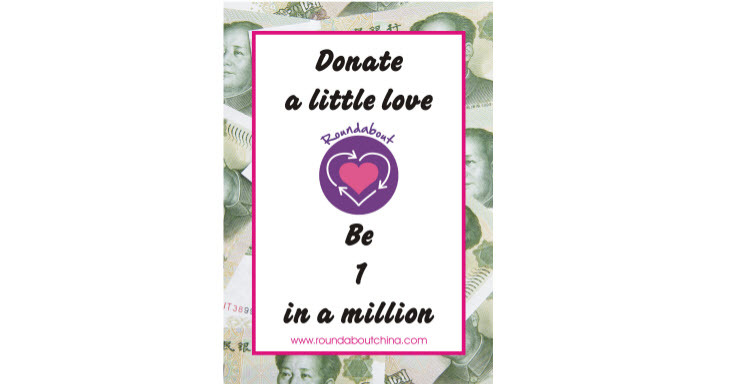 Gift Aid Cards will be available from the Roundabout store in Shunyi ( see our contacts page for the address ) from FRIDAY 29th November onwards. The perfect present for your loved ones, teachers, friends and neighbours.